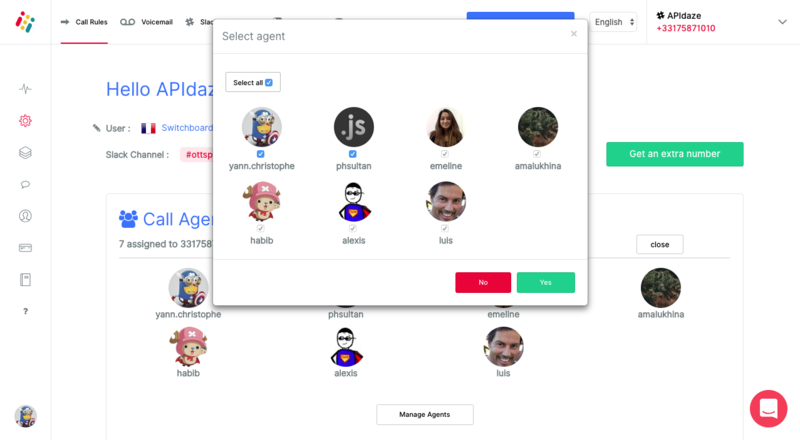 In the Desktop app, you can choose which user can place and receive calls for each Ottspott number. So, if a user is not assigned to an Ottspott number he will not be able to see this particular number in the Ottspott Desktop App. He will not be notified in the Desktop App for all incoming calls neither. To set up the call distribution rules, please go to the "Numbers Management" menu -> "Call Rules" section -> "Call Agents" sub-section. Click on the "Expand" button and check the users assigned to the number. you are setting up. To add or remove users from an Ottspott number, please click on the "Manage Agents" button and check or uncheck users. To submit, just click on the "Yes" button.